According to the Hollywood Reporter, the 1997 hit ensemble film, Soul Food, will be getting a sequel! George Tillman Jr., who wrote and directed the original, is writing the new script with Nathan Skulnik. 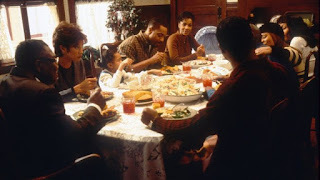 The movie was based on a close-knit African-American family who had a tradition of eating a big dinner together every Sunday but began to fall apart after the death of their matriarch. It included the likes of Vanessa Williams, Vivica A. Fox, Nia Long, and Mekhi Phifer. The film, which earned $43.7 million, also spawned a Showtime TV series, Soul Food: The Series,which aired from 2000 through 2004. The new sequel will focus on the new millennial generation of the family and their quest to return to their roots of family and tradition. Stay tuned to The Spotlight and all our social media links for more information as they become available for the movie. And if you haven't seen the original, definitely check it out, along with the Showtime series! I own the entire series on DVD!